Wir freuen uns, Ihnen Blackmoon Januar Digest zu präsentieren, wo wir über die Ergebnisse des Monats und die Pläne für die Zukunft berichten werden. Wichtige Highlights dieses Monats sind die abgeschlossenen Smart-Kontrakte, drei neue Rechtsfirmen und positive Rückmeldungen von Banken und Brokerfirmen. 1. Rebranding. Blackmoon Crypto -> Blackmoon. - Eine aktive Suche wird nach der Jurisdiktion für den Start der Tradingplattform ausgeführt (Prognose für die Lizenznahme - Mai 2018). - Dies beeinflusst den Start der Hauptplattform im März 2018 in KEINER Weise. was ist mit Rechtsfirmen gemeint? - Anderungen in der Einnahmewirtschaft. - Die Investors in Asset Tokens werden keine Strukturierungs- und Unterhaltsgebühren zahlen. - Update über die Continous Contributors. Die Rollen von Promotern, Analysten, Fondsmanagern sind mehr erleuchtet. Unser Projekt setzt sein Wachstum fort. Die erste Veröffentlichung des Plattforms wird sehr bald (Ende März) stattfinden. Unser Team freut sich darauf. Bitte lassen Sie uns wissen, wenn Sie weitere Fragen haben! wird es einen Airdrop / Bountys oder ähnliches geben zur Veröffentlichung? No. There will be no more any bounties or airdrops..
We have lift off! On March 30th, 13:30 pm UTC Blackmoon platform went live and opened up for user registration and verification. After 6+ months of continuous team effort from all our departments we are glad to celebrate this milestone with our community. Now is the time to ensure that this successful lift off is followed up with an equally successful journey towards reaching our main target in becoming a benchmark solution for asset managers in the blockchain industry. Investment in cryptocurrencies carries high degree of risk and volatility and is not suitable for every investor; therefore, you should not risk the capital you cannot afford to lose. Please consult an independent professional financial or legal advisor to ensure the product meets your objectives before you decide to invest. Regional restrictions and suitability checks apply. Sorry but ... what shall this be ? Investor Coin ? I dont have a good feeling about this since i dont see a Imprint neither a Contact Adress ? 1 Benutzer dankte Klickslave für diesen Nützlichen Beitrag. Heute sind wir stolz, Blackmoon Smart Kontrakte in GitHub öffentlich verfügbar zu machen! Hier ist ein Artikel von Ilya Remizov (CTO Blackmoon) mit Erklärungen über die Achillesferse von Smart Kontrakten im allgemeinen und über die zweistufige Architektur von BMC Kontrakten im besonderen. Blackmoon (BMC) announced that purchase of asset tokens are now available via your personal account at Blackmoon web site. One of the first funds is SPDR S&P500 ETF. SPDR S&P500 ETF token is the asset token of the exchange traded fund (ETF) which tracks the Standard & Poor’s 500 index. Blackmoon has made Blockchain history. We are proud to announce that crypto investors will soon have the opportunity to participate in the performance of Xiaomi IPO on the Hong Kong stock exchange. 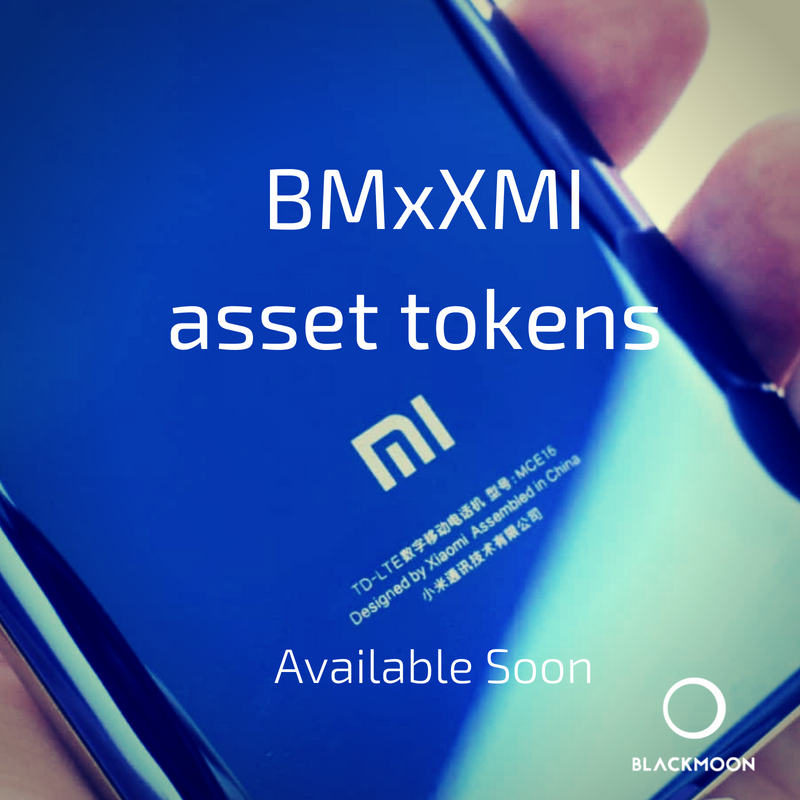 Blackmoon is the first company in the history to tokenize an IPO in this way and it and allows cryptocurrency investors and users access to the Xiaomi Corporation IPO. The decision behind the launch of the token was loyal to Oleg’s vision to promote a relevant product at the right time and place. Excitement about the launch is high and have already caught attention of some of the most trusted media outlets such as the Financial Times. So why the excitement many asked? “Well it’s quite simple.” Oleg Seydak answered reporters. “Historically participation in an IPO has generally been a prerogative of institutional traders, but now with the democratization of the the market and availability of new tools it has become available for everyone. We have provided cryptocurrency holders the option to participate in the performance of Xiaomi stocks without leaving the blockchain universe, and this is what Blackmoon has been all about from the start, ” he concluded. Xiaomi Corporation is an innovation-driven internet company with the aim to create “amazing” user-friendly products at accessible prices. Originated in China in 2010 by an outstanding team of engineers and designers, the company became the world’s fourth-largest smartphone company and the number one smartphone company in India. The company offers a broad range of hardware designed in-house and in collaboration with the partners, including smartphones, TVs and other smart devices connected by the IoT platform. More and more people all over the world are replacing their smartphones with Xiaomi because of the good “price-quality” correlation and the nice design. Xiaomi had revenue in the amount of approx: $17bn in 2017 which represented +67% growth comparing to 2016 year. - Tokens will be available for buyback to the platform in exchange for ETH shortly after the IPO despite the 93 days lockup on shares according to Xiaomi IPO terms. This is possible by applying short trading and forward contracts which allow the platform to fix the value of the asset and buyback tokens at current price of shares. In short, this is our answer to the current market trends and needs. We mentioned in the last digest that even though we kicked off the platform with straight forward “vanilla funds”, we realised that today the crypto investor is craving for another type of funds; a more liquid sort with greater return opportunities and more volatility. Enter Blackmoon’s first set of crypto funds. The first set of crypto funds follow three different strategies. Bellow is a brief description of each of the tokens. Let’s start with the token with the most “volatile’ strategy — for some maybe the most exciting. One Day Most Volatile Strategy is focused on delivering alpha to BTC by tracking those coins that have had the largest volatility during the previous 24 hour period. The core objective of the strategy is to generate the returns corresponding to the yield of the crypto assets with the largest volatility. The portfolio will contain max 20 min 5 positions. Top 20 Market Cap Monthly Strategy is focused to deliver alpha to BTC by tracking those coins that have had the largest market capitalization in the previous three month period. The core objective of the strategy is to generate the returns corresponding to the yield of the cryptocurrencies with the largest capitalization. Daily Delta Rebalancing Strategy is focused on delivering alpha to BTC by adjusting the basket of the top 6 market-cap of coins and cash. The core objective of the strategy is to generate the returns corresponding to the yield of the top 6 cryptocurrencies with the largest capitalization providing downside risk protection by dynamically allocating portfolio between cash in crypto. First asset token sales on the Platform are live! Registration and KYC are OPEN. Join now! Diese Seite wurde in 0.609 Sekunden generiert.